Creative chefs are adept at tapping into trends by means of ingredients. The addition of feta cheese and tzatziki to a basic burger gives it a Greek slant, just as topping the burger with kimchi addresses the interest in Korean cuisine. This fundamental menu research & development strategy puts the focus squarely on ingredients, and ingredients currently trending add a dimension of color along with oomph and interest to dishes. Turmeric. Menu intel experts at Datassential report that the presence of this spice on menus has grown by 154 percent in the past year. While its bright, orangey-yellow color is typically associated with Indian curries, it is widely used here to give American-style mustard its golden glow. Its strong growth on menus reflects both the increasing influence of Indian foods as well as its purported anti-inflammatory properties. Pret à Manger, the fast-casual English import operating 84 stores in the United States, touts its “natural” ethos that stresses tasty, wholesome foods. Its vegan carrot-turmeric soup with tahini is a good example, as is its falafel & turmeric cauliflower Balance Box that includes Brussels sprouts, beet hummus, brown rice, red quinoa and turmeric-miso ginger dressing. Cava Mezze, with five units in the Washington, D.C., area, delivers an updated take on Greek classics. Dinner entrées include salmon with turmeric paste and beet couscous, and mushrooms with turmeric butter, metaxa brandy and kefalograviera, a Greek cheese. The fried cauliflower at Hopleaf in Chicago is turmeric-brined and beer-battered, and the turmeric latte at As Quoted in San Francisco boasts fresh turmeric and ginger along with almond milk and coconut sugar. Charcoal. Black is back, and the Specialty Food Association has named “Goth food” one of its hot trends for 2018. A few years ago there was a boomlet in black foods, whether fermented like black garlic or naturally occurring like black lentils and cavolo nero (black cabbage). In its latest incarnation, the inky hue derives from charcoal. Arresting in color and also boasting health benefits, activated, edible charcoal can be made by carbonizing food over extremely high heat. The incinerated result is typically black as night. Olivella, an independent restaurant in North Bergen, N.J., serves pizza with a charcoal crust, as well as activated charcoal mozzarella and pasta. Nékter Juice Bar, headquartered in Santa Ana, Calif., introduced the Charcoal Vanilla Skoop made from plant-based ingredients like cashew milk and agave nectar as well as sea salt and a pinch of activated coconut charcoal as a Scary Skoop Halloween treat. 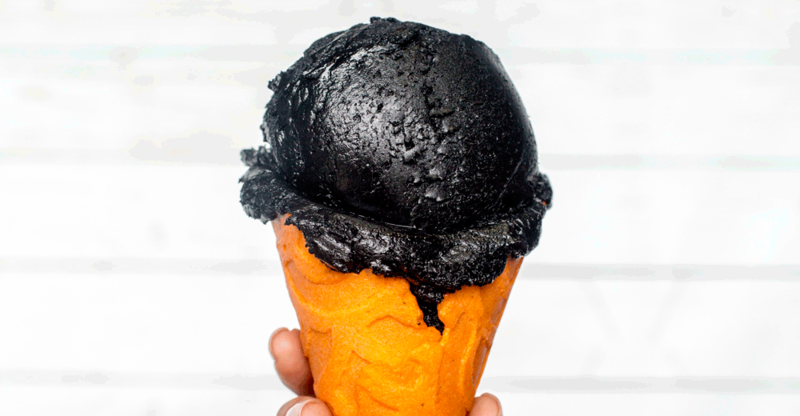 Morgenstern’s Finest Ice Cream, which bills itself as a New American Ice Cream Parlor in Manhattan, dishes up Black Coconut Ash ice cream, and in Los Angeles, Little Damage’s version of soft serve includes Almond Charcoal in a charcoal cone, a black-on-black specialty. Charcoal is making beverages fade to black, too, as with Charcoal Lemonade, a summer drink special at California-based Eureka! restaurants, which was made from passion fruit, lemon and activated charcoal. On the bar side, Spoke & Steele in downtown Indianapolis concocted Not Kilgore’s Drano from Scotch and rye, sea salt, lemon juice and activated charcoal for a dramatic, dusky quaff. Gochujang. Along with black and yellow, the deep red of the fermented Korean condiment is also brightening menus. Made from red chiles, gochujang’s sweet heat appeals to the American palate, and its frequent promotion as a barbecue sauce enhances its accessibility. Datassential pegs its growth on menus at 300 percent over the past four years, reflecting a very broad range of applications. Duck Wing “Lollipops” at Seasons 52 are treated to a gochujang glaze, and Red Lobster’s Korean BBQ Shrimp receive a flavor boost from gochujang, sesame oil, ginger and brown sugar. Umami Burger’s K-BBQ Burger is a Korean triple threat, with gochujang glaze, caramelized kimchi, and Korean ketchup. Chego offers a variety of rice bowls at its two units in Los Angeles, where the popular Chubby Pork Belly Bowl is made with gochujang-lacquered Kurobuta pork, a fried egg, pickled radishes, Chinese broccoli, water spinach and peanuts. Also making an appearance on menus is gochugaru, red chile flakes or powder that is a primary component of gochujang. The spice has popped up recently in a shrimp dish at Outlook Kitchen + Bar in Boston, and as a tabletop condiment at Exchange in downtown Los Angeles. Nancy Kruse, President of the Kruse Company, is a menu trends analyst based in Atlanta. As one of Linked In’s Top 100 Influencers in the U.S., she blogs regularly on food-related subjects on the Linked In website.